To prepare to teach her first-ever workshop on Shakespeare, Kelly Hunter did what all serious Shakespearean actors do: she immersed herself in the text. It was the early nineties and as part of a small tour she was doing with the Royal Shakespeare Company, Hunter had volunteered to lead a session on Measure for Measure at a men’s prison. 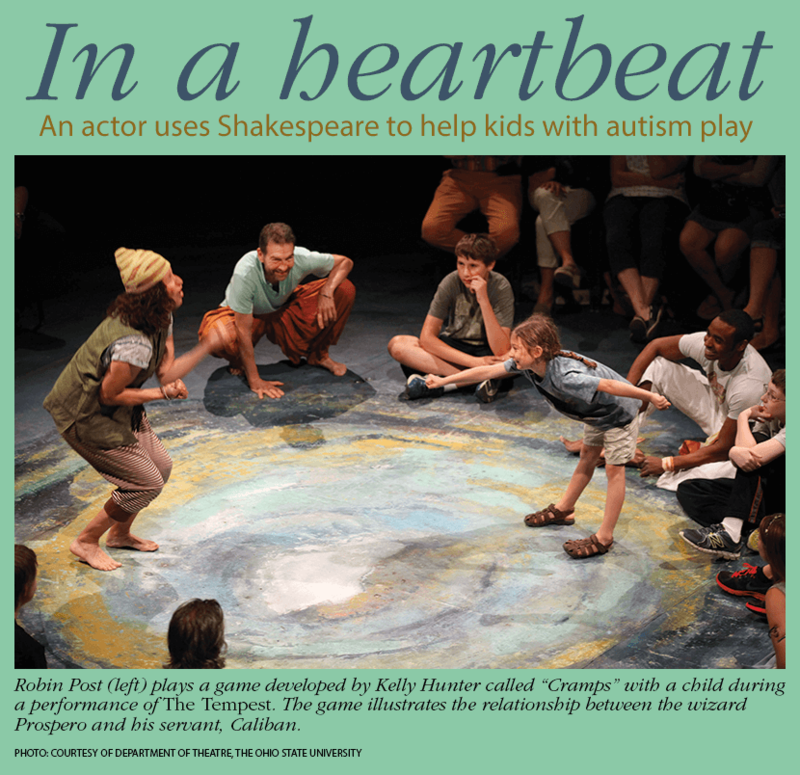 In the introduction to her book Shakespeare’s Heartbeat: Drama Games for Children with Autism, Hunter recalls her process prepping for the class. She dissected speeches, created scripts, and arrived at the prison with her arms full of photocopies. Only to discover that many of the men in her workshop struggled with reading. Still, her many hours of preparation paid off; she knew the play inside and out. From memory, she taught the men some essential lines, guided them through an improv exercise, and ultimately, a passionate discussion based on the major themes of the play emerged. Hunter did not work with the group again, but the day’s unscripted success lingered in her mind. Nearly ten years later, Hunter had established herself as an actor in the U.K., and it was while working with the RSC in Stratford-upon-Avon, Shakespeare’s birthplace, that she once again felt the urge to share Shakespeare’s work with a broader and more diverse population. Dr. Leo Kanner first described autism in the early 1940s. Autism is a neural developmental disorder characterized by two primary clusters of symptoms: difficulty with social interaction and communication as well as the presence of restrictive and repetitive interests and behaviors. The symptoms tend to present early in life, before age three. Autism is a spectrum disorder, so different symptoms present in different people in different ways—while some cases of autism are severe, requiring a great deal of intervention, others are considerably less so. A person with autism might struggle with reciprocal friendship, language, processing emotion, sharing emotion, understanding emotions as they play out on the faces of others as well as sensory sensitivity and repetitive body or motor movement. Rigidity around routine is also common. The specific cause of autism is a mystery, but research points to a combination of genetic and environmental factors. According to the Centers for Disease Control and Prevention, autism occurs in one in about every forty-five children, and autism is five times more common in boys than girls. The CDC also reports that almost half (46 percent) of children identified as having autism display average to above-average intellectual ability. What does a neurological disorder have to do with Shakespeare? Kelly Hunter has been working with young people on the autism spectrum for years, developing a series of drama games based on the poetry, feelings, and themes found throughout Shakespeare. Called the Hunter Heart-beat Method, the games are designed to be accessible, enjoyable, and inspiring to children on the spectrum. Four centuries after Shakespeare’s death, Hunter’s work presents new questions about the plays and the characters we’ve known so well for so long: does Shakespeare possess a power that hasn’t been fully tapped? We know that he can entertain, making us laugh and sob and sigh and rage. But can the simple rhythm of the language and the potent, uncut emotions coursing through his plays possibly serve as lifelines for those struggling to express themselves? Hunter’s eyes twinkle as she remembers her determination to play drama games with that first group of children with autism. She is not easily intimidated—fear, she says, is terrible for actors. She just kept asking. Fixed in Hunter’s memory is her first encounter with what is considered by some scholars to be one of the most important publications in the history of the English language: Shakespeare’s First Folio. Published after his death to preserve his work for future generations, the Folio contains thirty-six of Shakespeare’s plays. Without it, much of his work might have been lost to history. Hunter recalls reading As You Like It, moved to laughter and tears as she went. After three years at Glebe, though, Hunter was burned out and overworked. The funding for the project had run out and even though parents, she said, were disappointed the drama games were no longer available for their children, Hunter did not sense any interest in the work out-side of the school. She thought she had reached the end of a fascinating detour when just a couple years later, she was back with the RSC getting ready for a production that didn’t particularly excite her. The backing of the RSC gave Hunter a jolt of energy and administrative support and what proved to be a valuable connection: a longstanding educational partnership with The Ohio State University in Columbus. That would shape Hunter’s work and endeavors in the coming years. By the start of the academic year in 2011, a scientific, longitudinal research study of Hunter’s work was beginning to take shape. On board were five members of the OSU theatre department, faculty and students. That group, led by faculty member Robin Post, was to orchestrate a series of workshops with local schools in the Columbus area, playing Hunter’s specially designed games with children on the autism spectrum. Additionally, a new Ph.D. student in psychology, Maggie Mehling, guided by her advisor Dr. Marc Tassé, would run the study to see if the work yielded significant changes in the participating children. But that initial unease dissipated quickly. The group began with a feasibility study, just ten kids participating in one weekly session for fourteen weeks. The goal, Mehling said, was simply to assess the needs, details, logistics, and initial response to the work. Even in that short time, data showed improvement in the participants’ social skills—and the response from the students’ families was overwhelming. The group launched a year-and-a-half long pilot project, regularly playing Hunter’s games with children with autism at three different Columbus schools. Mehling was managing the study and gathering data while the actors were reviewing and revising the work. Hunter would visit periodically, and gradually, through hours of practice and trial and error, older material was strengthened and new material was developed, growing a simple series of drama games into the Hunter Heartbeat Method. Hunter recalls that early on she watched the team work with a particularly challenging group of children. Six months later, when Hunter returned to check in on the work, that group of students had been transformed. The games that comprise the Hunter Heartbeat Method are grounded in simplicity, physicality, and most importantly—fun. Each Hunter Heart-beat session follows a similar format. The group sits together in a circle; everyone places a hand over their hearts and pats the rhythm of a heart-beat as they say, “hello.” To anyone who has ever studied Shakespeare, the easy thumping matches the da-dum iambic pentameter pattern that underpins the poetry of Shakespeare’s plays. Soothing and unifying, the circle is followed by the games. The actors leading the workshop first demonstrate and then the entire room plays and then groups may share what they played. Another heartbeat circle closes the session. No scripts are used. Hunter’s games grow out of two plays, A Midsummer Night’s Dream and The Tempest. If played in the recommended order, the essential story, characters, and relationships of each play begin to surface. Games are drawn from some of the plays’ most expressive moments and beautiful ideas: Miranda teaching Caliban to speak; Prospero tormenting poor Caliban with awful cramps; Miranda and Ferdinand falling in love at first sight; Ariel gently leading Ferdinand around the story’s island home. The games are played without a lot of preamble—the actors and leaders of the workshop set the scene and then everyone gets down to the joyful business of simply playing. Each game, however, gently exercises some of the social and other skills that children with autism struggle with, such as making eye contact, spatial awareness, personal space and boundaries, reading faces, and expressing feeling. Hunter insists that each game reach a “point of ecstasy,” or POE. In her book, Hunter observes that Shakespeare’s work is packed with “moments of transcendence” which a POE ought to reflect. She describes a POE as the magical moment when “effort culminates in achievement and it’s clear that the game has been accomplished.” The games are easy to repeat and infused with an authenticity and spontaneity that should be familiar to actors. Genevieve Simon, an OSU alum now living and performing in New York, was a member of the first team that led workshops in the Columbus schools. Simon said that many of the children seemed to benefit from the work, but a few made a lasting impression. One middle schooler routinely arrived at the sessions already playing a character: Bruce Banner’s giant, angry, green alter ego, The Hulk. Hard days happen too. One of the hardest for her personally, Hunter said, occurred just recently when she witnessed a child have an intense meltdown. For the work to be successful, she said, it is essential that adult leaders and actors in the room be attuned to a child’s needs. The children should feel supported in the work—not pushed to do too much too quickly. Audrey Todd has found Hunter’s method and approach refreshing. Todd holds an M.F.A. in acting from Rutgers University and a Ph.D. in clinical psychology from Stony Brook. Her twelve-year-old son is autistic. Concerned about his possibly limited employment opportunities later in life, Todd started her own company in Columbus, a gluten-free bakery that also offers vocational and employment services to people with autism. After hearing about Hunter on the radio, she began to see workshops popping up around town. Todd was so interested she called Hunter and asked if she could teach the games herself. Todd’s son is non-verbal; he types to communicate. After one of his first experiences with the Hunter Heartbeat Method, he asked his mother a question, a rare occurrence. Mehling and Todd both point out that people with autism experience the same emotions as neurotypical people. It’s sharing those feelings and connecting to the inner life of another person that presents challenges. The Hunter Heartbeat Method offers children with autism a taste of something special: a chance to thrive in a social setting. Post feels the Hunter Heartbeat Method is effective training for young actors as well. The work sharpens the senses, focuses the mind, alleviates anxiety, and opens the body—core skills for the aspiring actor. Most importantly, the games are about living truthfully from moment to moment and experiencing each of those moments as something fresh, something new, something that has never happened before. Last May, Hunter and OSU staged an elegant and stripped-down production of the series of games she developed from The Tempest. The actors (including McClatchy) were paired with a child with autism and all sat together in a circle around a pool of light while the audience observed from a single, concentric outer ring. Pairs would perform a specific a game that illustrated a key moment in the story, organically allowing The Tempest to unfold. Kevin McClatchy, an OSU faculty member in theatre and involved with Hunter’s work for a long time, played Prospero, the grouchy, brilliant, and powerful wizard. The Hunter Heartbeat Method continues to gain ground. Hunter has a new company, Flute Theatre, and her desk in London is stacked with contracts and budgets. According to Todd, more schools in Columbus are requesting workshops. A prominent Ohio State alum, actor Patricia Heaton, and her husband David Hunt have made a gift to support workshops and another production of The Tempest, similar to the one held in May. Post has taken the work to the University of North Carolina Wilmington, where she is a new faculty member. At OSU, the next round of the research study is also underway. Mehling pointed out that the study focuses solely on determining whether or not the Hunter Heartbeat Method passes muster as treatment. The work is good for kids—no matter the results of the study, she said. She described seeing, firsthand, the Hunter Heartbeat Method make a kid light up and engage. If the study shows, scientifically, that Hunter Heartbeat Method can actually treat autism, then that only adds to the value it has for children and families. According to Mehling, the initial studies have shown statistically significant improvement in facial emotional recognition and pragmatic language. Certain social skills showed improvement in just the first fourteen weeks and then maintained, while other facial emotion recognition skills continued to improve. But, Mehling said, comparison to a functional control group didn’t happen. Children should show improvement over time, she said, they are growing and learning and going to school. In this next round of study, Mehling plans to compare a group of kids receiving the Hunter Heartbeat Method to another group that is receiving a more traditional, established form of social skills intervention that is not drama-based. Mehling’s background in neuroscience guided her to add a brain-imaging component as well. One of the core social deficits of autism, Mehling said, is difficulty recognizing emotions in faces. This deficit creates what she calls a “cascade effect” that negatively impacts social interactions for people with autism. The brain has entire regions meant for reading faces and processing emotions. The brains of people with autism show less activity in these specialized regions. Mehling described how the social skills of a child with autism are sometimes measured: A child would be shown a series of faces, each dis-playing a different emotion. The child would have to name the emotion they saw appearing on the face. Children would frequently get these answers right, Mehling said, but in a workaround way. Lots of studies, she said, have looked at children with autism at one point in time. It is cutting edge research to do brain imaging, treat, and then attempt to show gains using imaging data. Her own hypothesis is that the more naturalistic, drama-based Hunter Heartbeat Method will have a greater impact on processing and recognizing facial emotions than traditional social skills intervention, but this research is a new frontier. “There’s no precedent for this,” Mehling said. “We have hypotheses based on what we know and based on what we think. But this is really quite exploratory in nature, so we are really quite excited to see what we get. For Hunter, the thrill and the purpose of the work lies in igniting the spirits of children and creating circles of connection, safety, creativity, and warmth. Her favorite of her games is near the end of The Tempest. One person plays Ariel and the other, Ferdinand. Ferdinand closes his eyes and Ariel dings a tiny chime. Ferdinand must take a single step in the direction of the sound. Many with autism also show symptoms of dyspraxia, a condition that disrupts motor skills, and for them this exercise can be particularly challenging. Watching a child close their eyes, listen, and then take just that one step is real theatre. Shakespeare, Hunter feels, can electrify a child’s experience of the world.